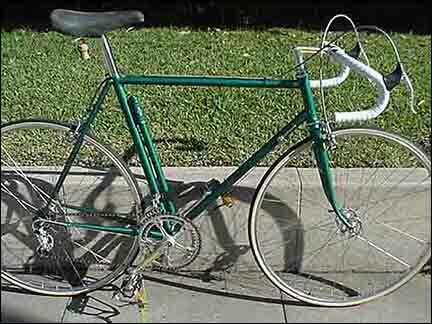 A 1975 Peter Johnson bicycle, built in Portola Valley, California when Peter was 18 years old; approximately his 12th frame built. Heavily drilled and milled Campagnolo Nuovo Record derailleur. 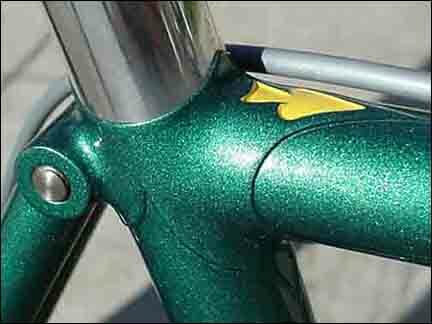 Note holes in back of derailleur body and milling in the spring cover. Arnold Industries black anodized aluminum replacement bolts and Roger Durham Bullseye red-anodized replacement pulleys. 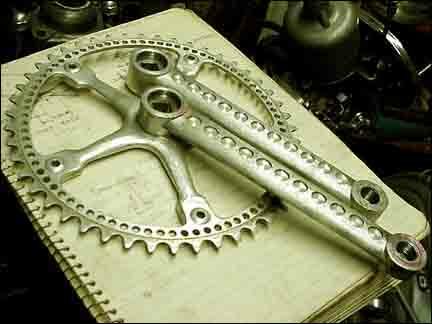 The Campagnolo Nuovo Record crank and spider has been milled on the back to match milling on the front. 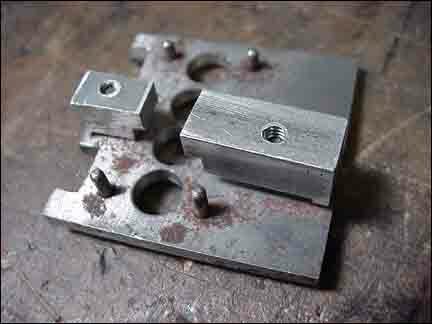 The front derailleur clamp and cage have been heavily drilled and a spade is cut in the front of the clamp. 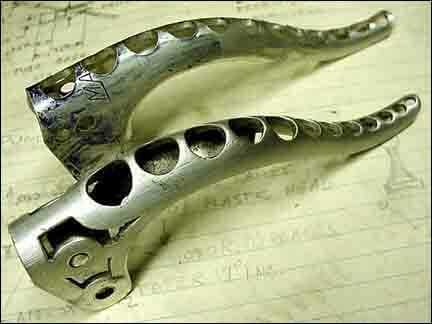 Campagnolo shift levers have been profiled and polished till no trace of a logo remains. Note the absence of lever stops. Cinelli 1A stem has been milled on each side and a spade has been cut in the front. 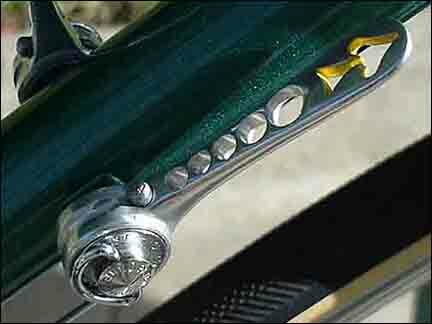 The Record brake levers have holes drilled in the back side too. 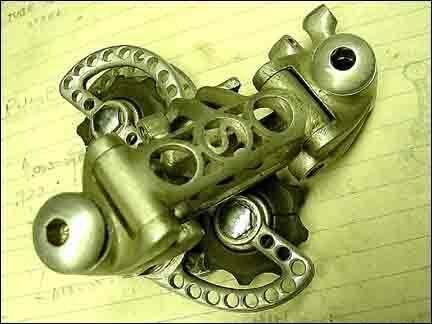 Frank Spivey profiled every surface of this Campagnolo Nuovo Record derailleur. 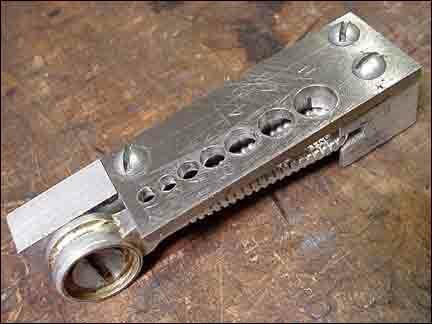 Some of the fixtures Frank created in the late 60s and early 70s to drill parts. 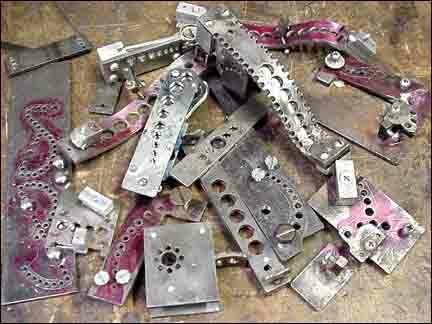 Hard to believe, but these started out as Campagnolo Record cranks. 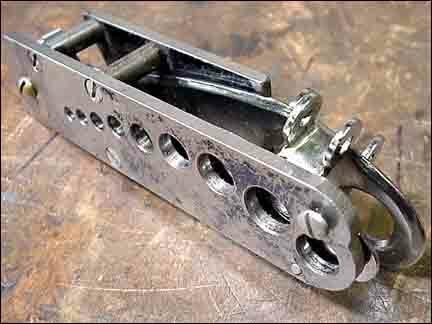 Fixture to drill a series of holes down the sides of Camapgnolo Record brake levers. Notice that the holes are angled in from the corner of the fixture. When you look in the small hole at top center you see the "C" of the Campagnolo logo; this references the lever inside the fixture. 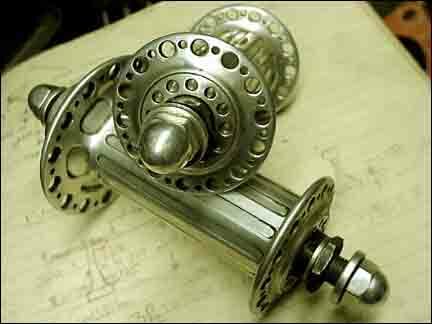 A set of hubs Frank machined from aluminum billet in the late 1960s. 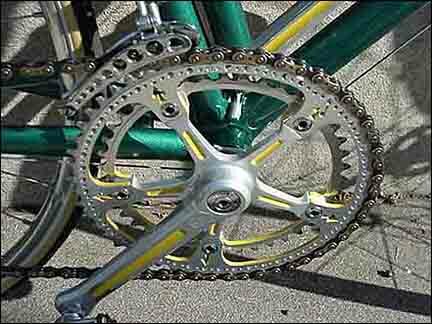 Campagnolo axles and bearing races were incorporated. 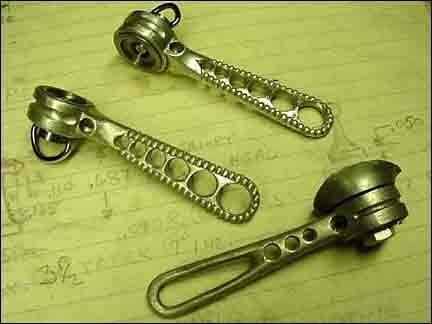 A set of Campagnolo down tube shift levers that have been drilled and another lever that has been heavily profiled. 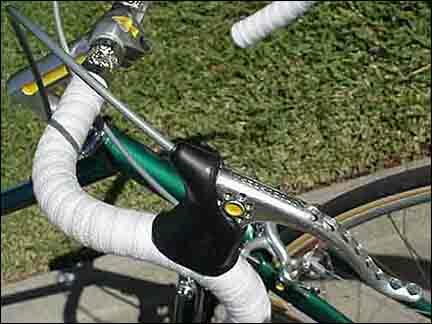 Campagnolo down tube shift lever fixture. 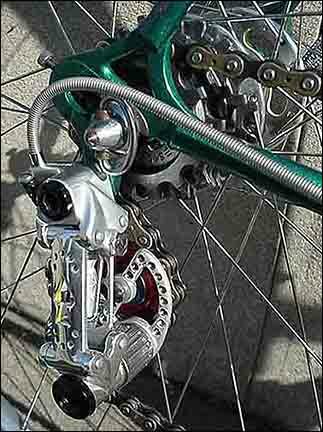 Campagnolo Nuovo Record rear derailleur pulley cage fixture with drilled pulley cages. 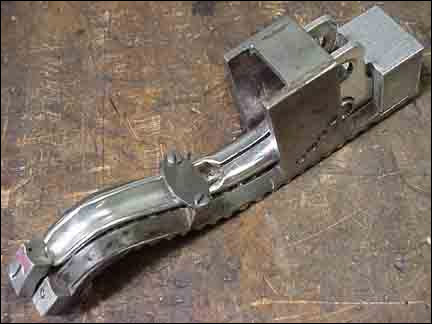 Campagnolo Record front derailleur cage fixture for drilling the back as well as the front. 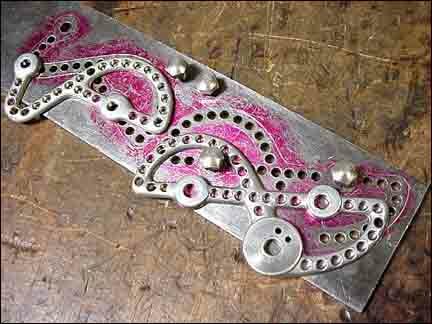 Notice the graduated size holes and spacing; very handsome. Fixture for drilling the Campagnolo Nuovo Record rear derailleur body front and back. 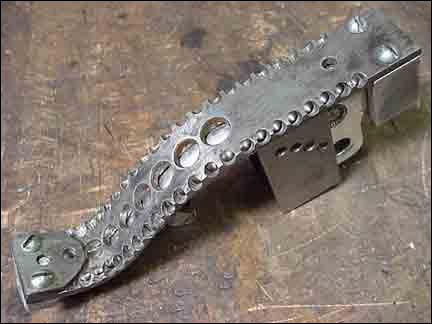 Two different patterns of drilling in a set of Mafac brake levers.